New York : Wendy Lamb Books, ©2007. Boy Scouts of America -- Juvenile fiction. Boy Scouts of America -- Fiction. Reading level: age 8, 9, 10, 11, and 12. 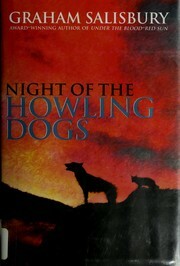 Add tags for "Night of the howling dogs". Be the first. Earthquakes -- Hawaii -- Juvenile fiction. Hawaii -- History -- 20th century -- Juvenile fiction. Earthquakes -- Hawaii -- Fiction. Hawaii -- History -- 20th Century -- Fiction. schema:about <http://experiment.worldcat.org/entity/work/data/1046382625#Organization/boy_scouts_of_america> ; # Boy Scouts of America. <http://experiment.worldcat.org/entity/work/data/1046382625#Organization/boy_scouts_of_america> # Boy Scouts of America.